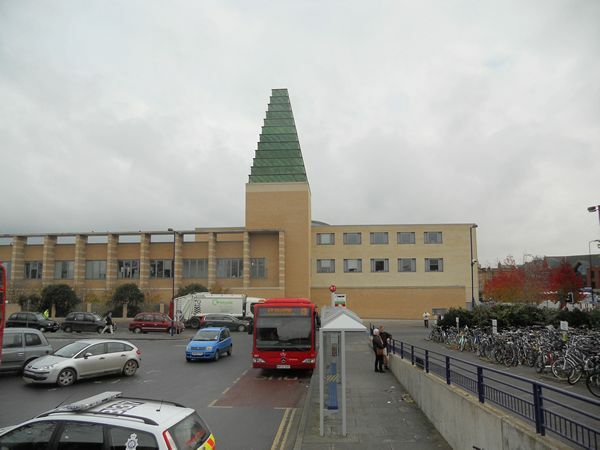 JUST FIVE MINUTES away from where I live is the Saïd Business Centre – part of the University of Oxford. And so then to Silicon Valley comes to Oxford, to hear of cabbages and kings in the interwibble world. Saïd is just opposite Oxford Railway Station – I’ve been there waiting for a Number 5 bus up the Cowley Road to hear a lass say in loud tones of wailing: “I come to Oxford for the dreaming spires and this monstrosity is ahead of me”. Or, as my builder said today – I think the architect loved it more than the people who have to use it. Perhaps slightly unfair. But it is a blot on the landscape when you first arrive in Oxford. And inside, as one very senior journalist vouchsafed to me this morning, it’s pretty hard to find the toilets after you’ve tipped up in the City of Screaming Squires. This entry was posted in Uncategorized and tagged biz stone, blot on the landscape, cowley road, lacrosse, Oxford, oxford railway station, Rose and Crown, Said Business Centre, Silicon Valley comes to Oxford. Bookmark the permalink. Remember HRH The Prince of Wales speech at the 150th anniversary of the Royal Institute of British Architects (RIBA), Royal Gala Evening at Hampton Court Palace in May of 1984? I think he would class that building as a carbuncble. “Oops” as in “Oopsy Daisy”, shorely. Wheeel, I had fun with it anyhoo.